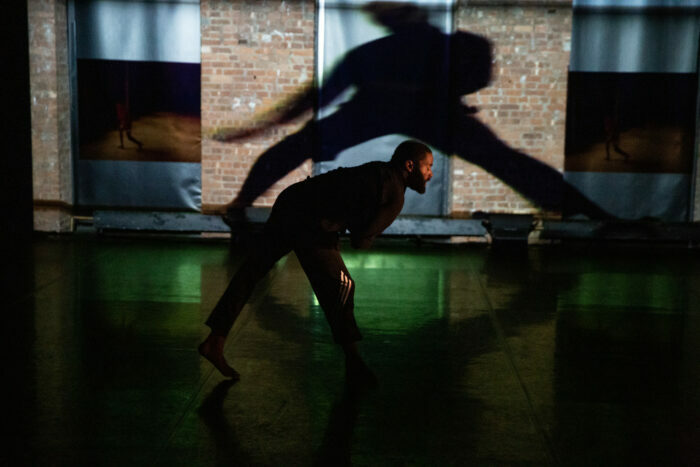 Described by the New York Times as “the inexhaustible,” Jerron Herman is a choreographer, writer, principal dancer and development director with Heidi Latsky Dance. Last November, Jerron premiered his solo work, Phys. Ed., as part of DoublePlus, curated by Alice Sheppard. 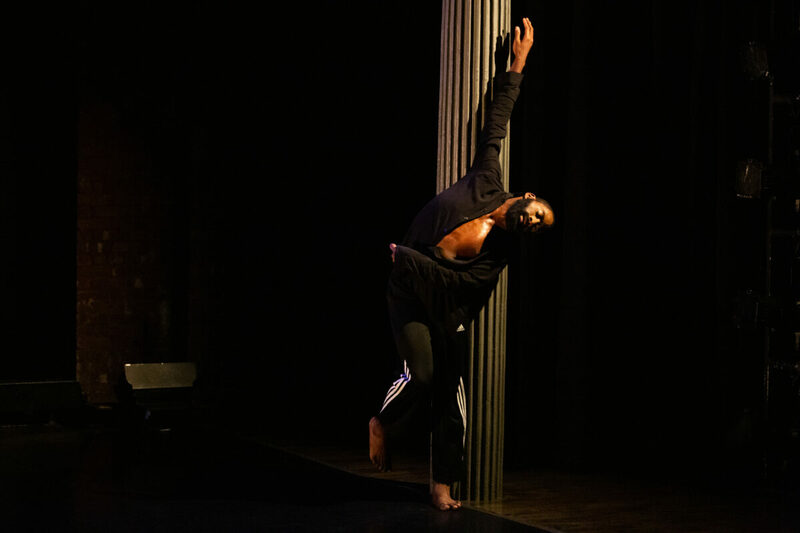 Jerron Herman sat with Alicia Bauman-Morales, Gibney Curatorial Intern, on January 31, 2019 to talk about creative process, life as a multi-genre artist and dancing with cerebral palsy. Below are quotes from the full interview. I started out with this really ambitious dream to come to New York and become a writer for Broadway, for SNL and do it that way. That ambition travelled through high school and got me here. I still haven’t integrated it in the way that I want to, explicit text, monologue in my pieces. I’m still figuring out what that looks like because I don’t want it to feel alien or separate. I’m actually comfortable with compartmentalizing the two practices. So what writing is, what dancing is, separating those, because they do offer different perspectives into my world. Movement not having to be explained, not having to be commented on, has been incredibly liberating. My body is the art, and that has been incredibly liberating since I began in it. With writing, it serves its purpose, too, because I love imagining what I’m writing about and letting people into that imagination as well. The last play I wrote, the main character learns to dance, and he learns to dance from another disabled character, and that was really explicit. I got to talk about the philosophy around movement for this play which was actually very physical, directly informed by my practice as a dancer. Similarly, for the last dance piece I did—here at Gibney—I employed audio description text and tried to put that on its head, tried to comment on accessibility and how we usually approach it and how we can do it a little bit creatively. I love the idea that we are conscious and that we have to open space for everyone to sit in the things that we create, but I don’t want to lose the discomfort of what comes out of creativity and not pigeonhole myself into “All right, I’ve got to make it accessible! How do I do that?” but that it flows from a more creative place. Writing has helped me be more accessible, and so has dance. I just operated in curiosity. I don’t think too much—or too heavily—about if I’m checking boxes anymore. So this was a point for me to think about what I could tell myself that I could do really well and to identify, and I thought about the context in which that was stripped for me—and it was PE. It was the personal historical moment that I really felt powerless. I felt creatively limited and physically limited, and I wanted to go back to that moment and till it, change it up, because of my own desire to never keep a negative perspective on a point in my life. I really wanted to embue that time that I thought of as negative with a reference of beauty and to really recreate it. I wanted to go back to that thing that gave me a lot of pain, and I wanted to plant lilies, I wanted to plant beautiful things, I wanted to refresh that idea for myself and transform it into something beautiful. The adage “Jack of all trades, master of none” really freaks me out because I identify with Jack of all trades or Renaissance Man or identify with this idea of having multiple interests. And I fear that, on the outside, it looks like you are fickle and undisciplined. And I really want to invest in multiple areas and give them equal weight and not just kind of vacation in studio art, vacation in dance, vacation in medical study writing. I actually want to put myself into each of those things. I’m figuring out this capacity, when you discover your capacity for whatever, how you give it an authentic capacity—also, how do all those things come back into a work that you want to create—a piece? How do all those things also filter back into my creative process when it doesn’t have to be about a 9-to-5 or a contracted project, but when it’s about how I’m making work? Interdisciplinary means not just I have facility in all these things but how does my facility in all these things invest in what I am actually creating? Photos: Jerron Herman from DoublePlus Fall 2018 performance. Photos by Scott Shaw.